Breakfast Scramble Soft Tacos are a bright & flavorful dish for breakfast & brunch! Last Friday, while Roger & I were on our weekly grocery shopping trip, we were discussing all of the yummy recipes we could create over the long weekend. Idea after idea rolled through our heads as we rounded each aisle. 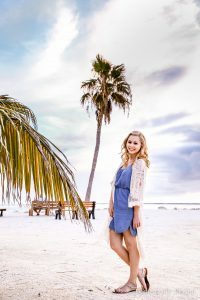 By the time we hit the frozen section our cart was filled with fresh ingredients & our hungry stomachs were grumbling with eagerness for the weekend festivities to begin. One of the reasons I personally love the frozen aisle is because it is the aisle of possibilities! I know it might sound crazy, but even as a vegetarian I always find inspiration from the meat filled dinners in the frozen aisle. As we headed toward the checkout out I spied a frozen breakfast scramble filled with potatoes, eggs, & meat. I quickly suggested to Roger that I could make a vegetarian rendition for him sometime during the week. 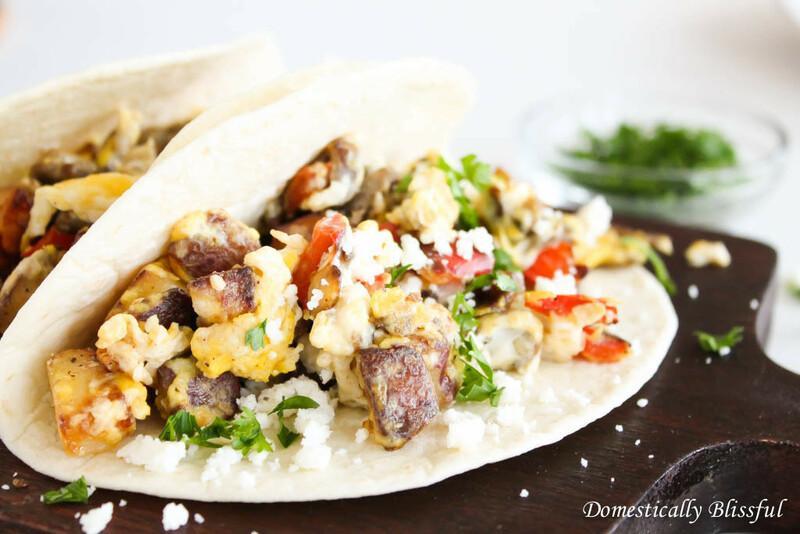 As we stood in line at checkout the idea transformed into Breakfast Scramble Soft Tacos & in an instant I was running back through the store grabbing the supplies we needed for this yummy idea. I might have looked a little crazy running through the grocery store, but it was well worth it! 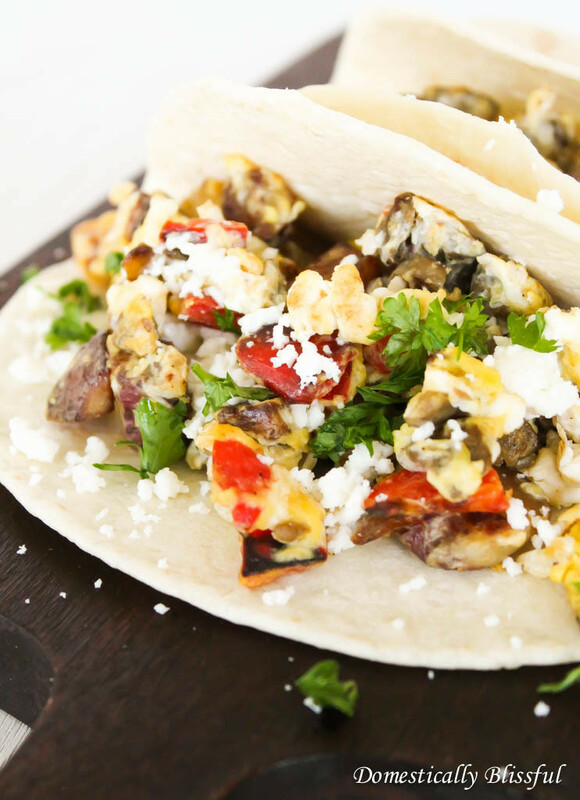 These Breakfast Scramble Soft Tacos are filled with fresh flavors & bright ingredients for a savory mouthwatering breakfast! Cook for 15-20, flipping the potatoes every 4-5 minutes. 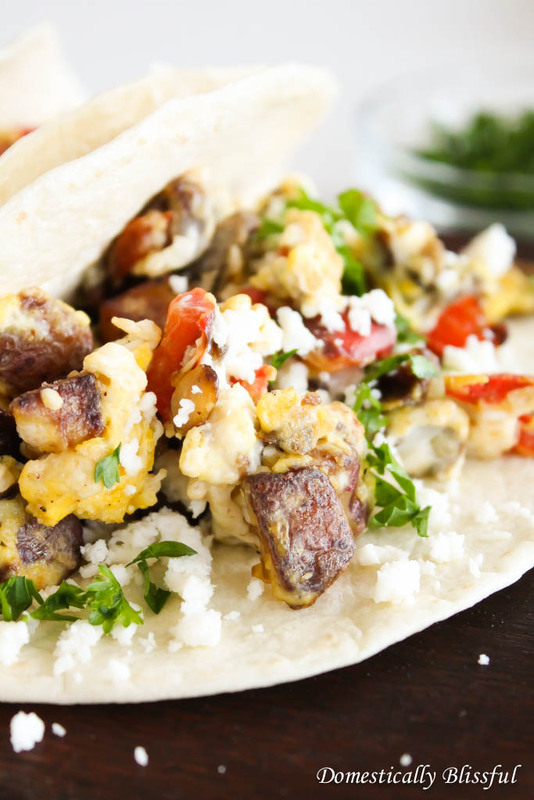 Once the potatoes are golden brown add the diced red pepper & vegetarian breakfast sausage. Cook for 2-3 minutes then turn your stove up to medium-high heat & add your 4 large eggs. *1. This helps cook the potatoes faster. *2. Diced onion would make a nice addition as well. *3. I prefer my eggs well done. *4. Leftovers can be saved in a sealed container in your fridge for 3-4 days. 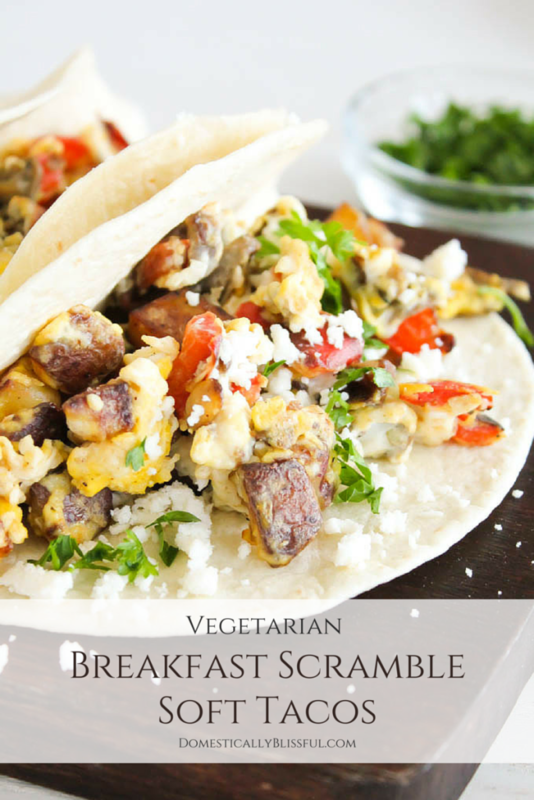 I’d love to see your Breakfast Scramble Soft Tacos!